Daniel Radcliffe attended the 68th Annual Tony Awards at Radio City Music Hall on 8 June 2014 in New York City. Daniel Radcliffe looked very dapper in a Made-to-Measure satin peak lapel navy tuxedo, over a white dress shirt. He accessorised with a bow tie and black patent leather shoes, made exclusively for the 68th Annual Tony Awards by Ermenegildo Zegna. Great grooming from Daniel Radcliffe. Love the gentle side swept hair and subtle stubble. 'Harry Potter' is all grown up now. 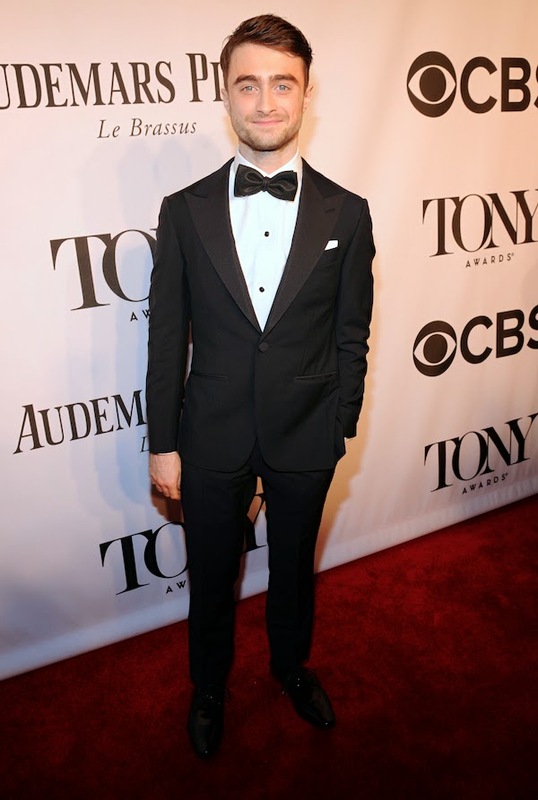 Do you like his look at the Tony Awards? On a side note: interesting body language from Erin Darke, Daniel Radcliffe's girlfriend. The lapels are way to wide for his narrow frame..